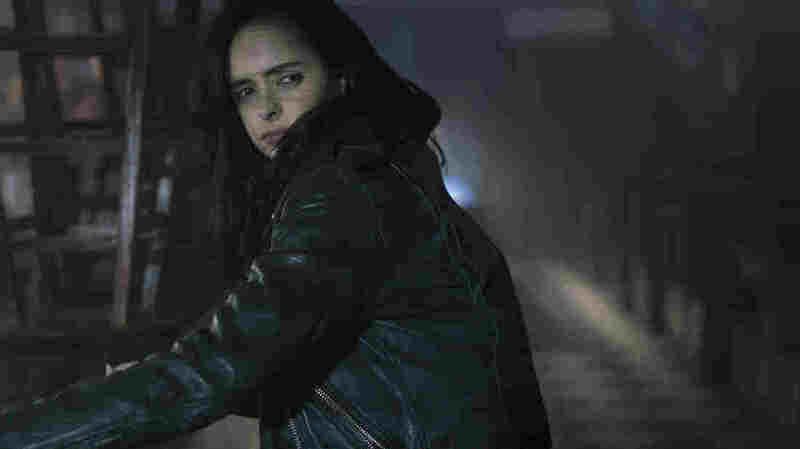 Marvel Comics Meet Reality On The Not-So-Mean Streets Of Hell's Kitchen In Netflix's newest Marvel Universe show, The Defenders, Jessica Jones, Luke Cage, Daredevil and Iron Fist patrol the dirty streets of a Hell's Kitchen that doesn't exist in today's New York City. In Netflix's new show The Defenders, Jessica Jones and her superhero friends patrol the grim and gritty streets of a Hell's Kitchen that no longer exists in today's New York. Hell's Kitchen has long served as pop culture shorthand for New York City at its grittiest. Four popular Netflix series based on Marvel Comics heroes use this neighborhood as a backdrop. Now those characters — Daredevil, Luke Cage, Jessica Jones and Iron Fist — will team up in one of this summer's most hotly anticipated TV shows, The Defenders. But does their version of Hell's Kitchen bear any resemblance to the real city? I went to Hell's Kitchen with Fred Van Lente, a comic book writer and historian who's lived in New York City for decades. He says the neighborhood was once an infamous den of crime. In the 19th century, the story goes, a couple of cops were policing a riot near Tenth Avenue. One called it Hell. "And the other cop said, 'No, no, Hell is a much milder climate. This is hotter. This is Hell's Kitchen. And so that's where the name comes from." The scrappy Hell's Kitchen mythologized in the Marvel universe is filled with bruisers and brawlers who crash in its flophouses and drink in its working-class bars. And it's got the kind of cheap crummy offices where a superhero might moonlight as a detective, or a crusading lawyer. "This stretch of Ninth is some of the best eating in Manhattan," Van Lente says. Welcome to the real Hell's Kitchen of today — Van Lente points out a fabulous post-modernist structure that exceeds anything you'd see in Architectural Digest, which he describes as looking "like someone put an apartment building inside a large plastic cub." It's the kind of building where a studio apartment could sell for close to a million dollars. "This is really, really different from what you would have seen here a hundred years ago," Van Lente laughs. "This is really different from what you would've seen in the '80s." That's when the editor-in-chief of Marvel Comics moved to New York City — in the '80s. Axel Alonso met me on West 54th St, and I asked him why this neighborhood is so important in the Marvel Universe. "In Marvel comic books, Hell's Kitchen sort of functioned as Mean Street Central, the underbelly of society, the place where there are predators and prey." Today, those predators are more likely to be the people charging you $50 for a blowout, or $20 for an omelette at brunch. "We're fudging the truth with Hell's Kitchen right now, you know, as you and I walk the streets, we see the development and the cafes," Alonso says. Superheroes defending Hell's Kitchen as it is now, filled with rich people — that's not a good look for superheroes. The New York of an earlier time informed so many iconic comics. Alonso says fans would revolt if you moved characters deeply associated with New York to anyplace authentically grittier, like Detroit. Alonso adds that Luke Cage's Harlem has been updated, much more so then Hell's Kitchen. And the Marvel universe is making a point of weaving in stories about gentrification: In Netflix's Daredevil, an evil real estate mogul kills tenement activists who will not move out of their rent-controlled apartments. He's motivated only by greed. Fred Van Lente says that's a smart approach for Marvel — or any other media company walking the line between nostalgia for a rough-edged new York of decades past and the playground for the one percent that much of Manhattan is today. That said, you have to make Hell's Kitchen something it's not in order for it to work. "Superheroes defending Hell's Kitchen as it is now, filled with rich people — that's not a good look for superheroes," he says. "'No, I only save the rich people!' You're not going to get a lot of good PR out of that." There was a time when TV shows like Friends painted a picture of New York City that was aspirational, yet affordable. Funny now, in a New York that's remarkably safe — but that few can easily afford — how pop culture is manufacturing the menace.